Don't Miss Out On Traders.com Advantage! Traders.com Advantage gives you the information you need to trade successfully. Traders.com Advantage content is original to Traders.com. This original content contains ideas, insights, evaluations, tips and techniques that can help you trade smarter. Best of all, access to Traders.com Advantage is free to subscribers of STOCKS & COMMODITIES Magazine, along with access to Working Money! You can choose to subscribe to Traders.com Advantage at any time during your trial subscription period for just $89.99 a year! Techniques: New ways of using old ones. New ones being developed. Reviews: Does that software work? Will that book help me? How-to: Step-by-step directions for calculations and analysis. Insights: A new way of looking at something that may have stumped you. 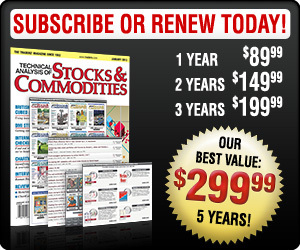 Try the fresh new Traders.com Advantage material FREE — with no obligation — for a one-month trial. Register for free 1-month trial. No thanks. Please return me to the S&C home page.